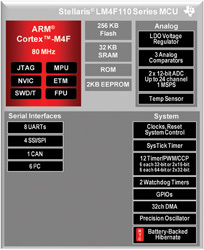 Texas Instruments’ LM4F110 Series of ARM Cortex-M4 microcontrollers with floating point encompasses MCU control applications generous serial communication peripherals including up to eight UARTs, six I2C, four SSI/SPI, and a CAN controller. Embedded flash sizes range from 32 to 256 KB with 12 to 32KB of internal SRAM. All the devices include 2 KB of EEPROM and are offered in several board-friendly packages, including 64-LQFP, 100-LQFP, and 144-LQFP. 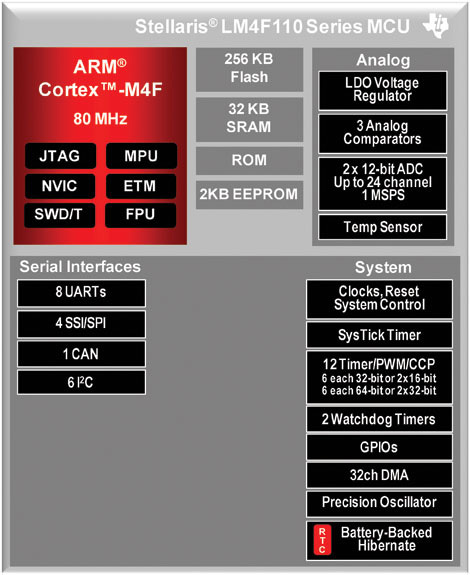 In addition, every LM4F110 Series MCU is supported with the renowned StellarisWare® software, including features preprogrammed in memory-saving ROM.